It's pretty easy to find Golf in Queenstown, thanks to some spectacular backdrops, plenty of open space and an enthusiastic golfing population! There are five golf courses close by, all with their unique attractions. Queenstown Golf is some of the most beautiful on earth. Teeing off with a snow-capped mountain behind you, or 'roughing' it beside Lake Wakatipu, you'll be hard pressed to find anywhere as relaxing as Queenstown. Millbrook, near Arrowtown, is a premier resort, with a hotel, bars, restaurants and top of the range facilities. Snapping at its heels, though, is Jack's Point, which enjoys some of the very best views of the Remarkables and a stunning golf club complete with cafe/restaurant. 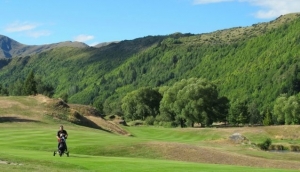 For a leisurely round with friends, head for Arrowtown or Frankton Golf Course. The Hills is an exclusive alternative, with its own spa, but you might have to join a waiting list. Kelvin Heights is often called 'the most scenic golf course in New Zealand'. Packed full of alpine vistas and stunning peninsula scenery, you'll find it hard to concentrate on your game.